There are 5 DNS records, such as a.ns.facebook.com, ns4.facebook.com, & ns3.facebook.com. 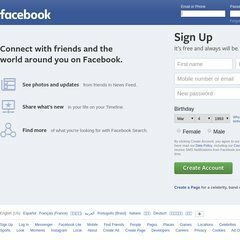 The server is hosted by Facebook Inc (North Carolina, Forest City.) Its local IP address is 66.220.158.16. PING www.facebook.com (173.252.101.16) 56(84) bytes of data. A time of 28.5 ms, is recorded in a ping test.